Dervla McTiernan delivered one of the best Australian crime debuts of 2018 with The Rúin. That book introduced detective Cormac Reilly who has moved to Galway from Dublin under a cloud with his partner Emma. There is plenty of backstory regarding the reasons for Reilly’s move to Galway and its connection to Emma. While McTiernan played a little coy with those details in The Rúin, in The Scholar this backstory comes to the forefront. One year on from the events of The Rúin and Reilly is not fully accepted by his colleagues or his boss, Murphy, who continues to assign him to cold cases. But then a plea from one of his colleagues to Murphy, for help and a call from his partner Emma changes all of that. Emma has found the body of young woman, run over near her lab at the university. The body is too disfigured to identify but an identity card in the pocket leads the police to believe it is Carline Darcy, granddaughter of famous chemist, wealthy industrialist and big university donor John Darcy. Reilly argues to run the case as a way of protecting Emma, a decision that seems rash at the time and later comes back to bite him. For most crime aficionados the solution to the mystery will become obvious fairly early (some short alternative point of view chapters help with this so it is probably intended). But the tension here comes from how Reilly and his team put the pieces together, the decisions that they make based on the limited information that they have and the impact those decisions and subsequent events have on Reilly and Emma. While The Rúin dealt with issues of child abuse and the care system, The Scholar’s focus is academic and corporate fraud, social inequality. Much like the police in Garry Disher’s Peninsula series, the Galway detective crew are all fleshed out. From their Superintendent, triathalon-obssessed cyclist Brian Murphy, to Carrie O’Halloran trying to balance work and life, to Reilly’s keen and incisive offsider Peter Fisher. Completing this picture are the other cases that the team is working on in and around the main murder investigation. 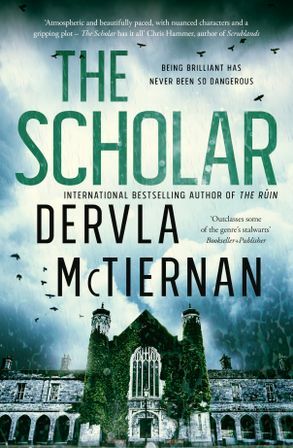 The Scholar is another great Irish procedural from McTiernan. She continues to build on the world and the characters that she delivered so effectively in her debut and answers many of the questions that were left hanging in the background of that tale. Once again, the book comes with a sneak peak at the next volume in the series. It’s likely that fans would be back even without this teaser.